Considerable cloudiness with occasional rain showers. High 62F. Winds NNW at 10 to 15 mph. Chance of rain 40%.. Mainly clear. Low 47F. Winds NW at 5 to 10 mph. Miguel Diaz takes off on the second leg of the 4X800 relay after receiving the baton from Richard Angeles at Nashville. 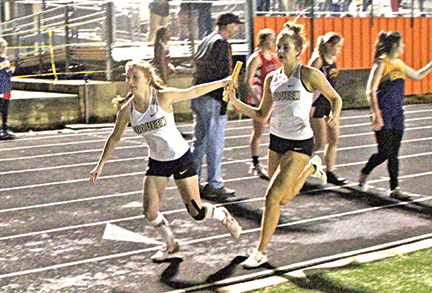 Kaitlyn Floyd gets the baton from Ashlyn Chambers at the midway point of the 4X400 relay at Nashville’s Scrapper Relays. The Leopards were third overall in the boys division. Team totals included: Arkansas High 102, Magnolia 100, De Queen 97, Lake Hamilton 93, Nashville 75, Broken Bow 53, Parkview 52, Hope 48, Mena 24, Ashdown 20 and Camden Fairview 14. Malik Beasley was a double winner again. The De Queen senior won the shot put with a distance of 49-4 and the discus with a throw of 161-7. Hector Hernandez by-passed the usual 800 meters and instead ran the 400, winning in 52.90. 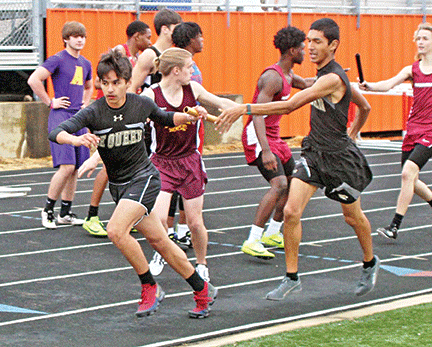 Hernandez anchored the 4X400 relay where a quartet of Leopard 800 runners not only pulled an upset to win in 3:34.93 -- with legs by Miguel Diaz, Kevin Villeda, Alejandro Lerma and Hernandez -- but also qualified for the 4A state meet. Lerma and Villeda placed second and third, qualifying for the state meet with time of 2:05.11 and 2:05.70 respectively. Asael Sanchez placed third in the 3200 meters with time of 10:52. Anthony Sanchez ran 4:59.96 for third in the 1600 and 11:05.61 for fifth in the 3200. Richard Angeles was seventh in the 1600 in 5:15.51. Angeles, Diaz, Fernando Ferretiz and Manuel Alvarez were seventh in the 4X800 relay in 9:27.58. De Queen’s 4X200 relay of Ryan Vance, Enrique Sandoval, Jose Hernandez and Ferretiz placed seventh in 1:43.83. In the field events Dailey Nickerson took second in the high jump with 5-10. Mack Carver was fourth and Chase Pearce fifth in the pole vault, both at 11-6. Nickerson went 18-4 for sixth in the long jump. Giovanny Felipe was eighth in the discus with 110-4. Arkansas High 119, Broken Bow 114, Lake Hamilton 85, Magnolia High School 78, De Queen High School 70, Ashdown 61, Parkview 56, Camden Fairview 39, Nashville 25, Mena 11, Dierks 10, Murfreesboro 10 and Hope 8. Ashley Dykes won the 400 meters in 63.63 and the 800 meters in 2:34.71. Ashlyn Chambers ran 2:39.13 for third in the 800. Pamela Delgado clocked 14:22.48 for third in the 3200. Josie Burke was third in the 100 meter high hurdles in 16.86. Kennedy Winship threw 106-6 for third in the discus. Maddie Martin took third in a season’s best of 50.68 in the intermediates. Martin was also sixth in the high hurdles, 18.53, and eighth in the high jump, 4-6. Delgado ran 6:30.82 for sixth in the 1600 with Xoctil Flores eighth in 6:37.08. Halley Gentry cleared 6-6 for eighth in the pole vault. In the relays De Queen placed fourth in the 4X400 with Martin, Chambers, Kaitlyn Floyd and Dykes running 4:34.97. The Lady Leopards were fifth in the 4X200 with Stacey Higgins, Anna Stinnett, Chastity Franco and Halle Harp running 2:07.18. Haley Manasco, Stinnett, Franco and Floyd ran 57.68 for sixth in the 4X800. De Queen did not enter the 4X800 relay.